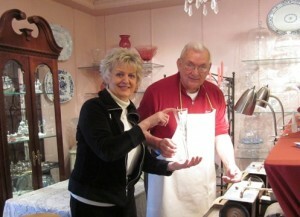 Mary Lou and Bob Gates have perfected the art of china and crystal repair. Bring in your chipped or cracked china, porcelain and crystal and let them work their magic. Minor repairs can be done while you shop. If you can’t make the scheduled dates, our store serves as a drop-off and pick-up site any time during store hours. Free Estimates.